Pr e s by te r i a n s To d ay | OCTOBER/NOVEMBER 2017 21 taken and were relegated to reserva- tions in a violent process justified by the Doctrine of Discovery. Many Native American children were forcibly taken from their families, sent to boarding schools, indoctri- nated with European values and compelled to dissociate with their native culture and language. A large group of Hispanics and Latino-as became Americans in 1848 when, at the end of the Mexican- American War, a large part of Mexico became what is now the southwest- ern United States. The prevailing economic model became one of debt and peonage that was based on low wages, racial inequality and oppression. The Bracero Program, a guest worker program, also brought millions of Mexicans into the United States to fill labor shortages in agri- culture. In recent years people from Mexico and Central America have faced persecution and prosecution in the U.S., where they have sought refuge after fleeing violence in their home countries. Asian-Americans also have come to the U.S. from many countries and cultures. It is the experience of American racism that binds this diverse community together. In some instances, racism has been expe- rienced specifically by people from a given country. For example, the Chinese Exclusion Act (1882) created a moratorium on Chinese labor immi- gration. People of Japanese ancestry, many of them United States citizens, were interned during World War II. Recently, the casting of Asians as the "model minority" has sometimes put people of Asian descent in a wedge position between whites and blacks. Racism still affects Asian-Americans. Looking at racism today Legal racial discrimination was largely banned in the mid-20th century and came to be perceived as socially unacceptable and/or morally repugnant. However, the institu- tions and structures of previous We believe • that Christ's work of reconciliation is made manifest in the church as the community of believers who have been reconciled with God and with one another; • that unity is, therefore, both a gift and an obligation for the church of Jesus Christ; that through the working of God's Spirit it is a binding force, yet simultaneously a reality which must be earnestly pursued and sought: one which the people of God must continually be built up to attain; • that this unity must become visible so that the world may believe that sepa- ration, enmity and hatred between people and groups is sin which Christ has already conquered, and accord- ingly that anything which threatens this unity may have no place in the church and must be resisted. Therefore, we reject any doctrine • which absolutizes either natural diversity or the sinful separation of people in such a way that this absolutization hinders or breaks the visible and active unity of the church, or even leads to the establishment of a separate church formation; • which professes that this spiritual unity is truly being maintained in the bond of peace while believers of the same confession are in effect alienated from one another for the sake of diversity and in despair of reconciliation; • which denies that a refusal earnestly to pursue this visible unity as a price- less gift is sin. 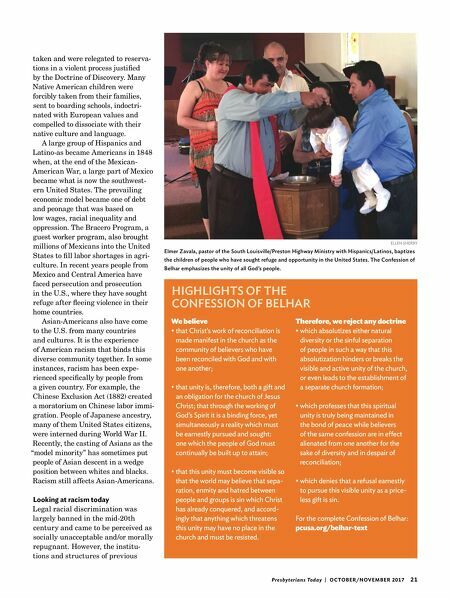 For the complete Confession of Belhar: pcusa.org/belhar-text HIGHLIGHTS OF THE CONFESSION OF BELHAR ELLEN SHERBY Elmer Zavala, pastor of the South Louisville/Preston Highway Ministry with Hispanics/Latinos, baptizes the children of people who have sought refuge and opportunity in the United States. 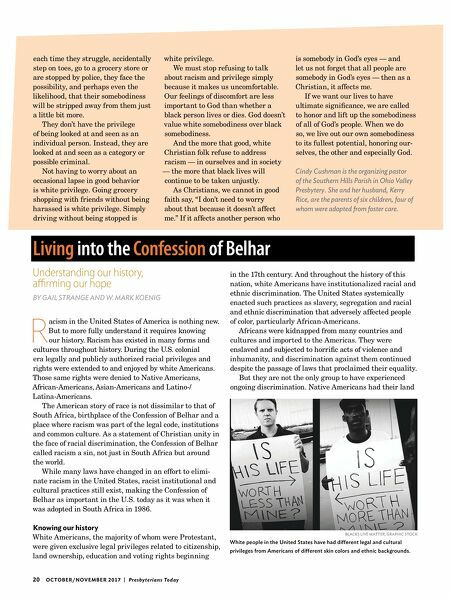 The Confession of Belhar emphasizes the unity of all God's people.